Honduras, officially the Republic of Honduras, often formerly known as Spanish Honduras, is a country in Central America, bordered to the west by Guatemala, situated at 3 Hours from Guatemala City, to the southwest by El Salvador, to the southeast by Nicaragua, to the south by the Pacific Ocean and to the north by the Gulf of Honduras and the Caribbean Sea, with Belize (formerly British Honduras) situated 50 miles (75 km) away, across the Gulf of Honduras. The Pre-Columbian city of Copán is a locale in extreme western Honduras, in the department of Copán near the Guatemalan border. It is a major Maya city that flourished during the classic period (150-900 A.D). It has many beautiful carved inscriptions and stelae. The ancient kingdom, named Xukpi, flourished from the 5th century AD to the early 9th century, with antecedents going back to at least the 2nd century AD. The Maya civilization changed in the 9th century AD, and they stopped writing texts at Copan, but there is evidence of people still living in and around the city until at least 1200 AD. By the time the Spanish came to Honduras, the once great city-state of Copán was overrun by the jungle. On his fourth and final voyage to the New World, Christopher Columbus reached the coast of Honduras in 1502, and landed near the modern town of Trujillo, somewhere along the Guaimoreto Lagoon, and had his priests say mass. After the Spanish discovery, Honduras became part of Spain's vast empire in the New World within the Kingdom of Guatemala. The Spanish ruled Honduras for approximately three centuries. Honduras declared independence from Spain on September 15, 1821 with the rest of the Central America provinces. In 1822 the Central American State was annexed to the newly declared Mexican Empire of Iturbide. The Iturbide Empire was overthown in 1823 and Central America separated from it, forming the Federation of the United Provinces, which disintegrated in 1838. The states of the United Provinces became independent nations. The so-called Soccer War of 1969 was fought with El Salvador. There had always been border tension between the two countries after Oswaldo López Arellano, past president of Honduras, blamed the poor economy on the large number of immigrants from El Salvador. From that point on the relationship between El Salvador and Honduras had been a sour one. It reached a low when El Salvador met Honduras for a three-round football elimination match as a preliminary to the World Cup. Tensions escalated, and on July 14, 1969, the Salvadoran army launched an attack against Honduras. The Organization of American States negotiated a cease-fire which took effect on July 20, with the Salvadoran troops withdrawn in early August. The war lasted approximately 100 hours and led to an arms race between the two countries. During the 1980s, the United States established a military presence in Honduras with the purpose of supporting the anti-Sandinista Contras fighting the Nicaraguan government and to support the El Salvador military fighting against the FMLN guerrillas. Though spared the bloody civil wars wracking its neighbors, the Honduran army quietly waged a campaign against leftists. Hurricane Fifí caused severe damage while skimming the northern coast of Honduras on September 18 and 19, 1974. Many years later, Hurricane Mitch devastated the country and wrecked its economic system in 1998. A Presidential and general election was held on November 27, 2005. Manuel Zelaya of the Liberal Party of Honduras (Partido Liberal de Honduras: PLH) won, with Porfirio Pepe Lobo of the National Party of Honduras (Partido Nacional de Honduras: PNH) coming in second. The PNH challenged the election results, and Lobo Sosa did not concede until December 7. Towards the end of December the government finally released the total ballot count, giving Zelaya the official victory. Zelaya was inaugurated as Honduras' new president on January 27, 2006. Honduras has five registered political parties: PNH, PLH, Social Democrats (Partido Innovación Nacional y Social Demócrata: PINU-SD), Social Christians (Partido Demócrata-Cristiano: DC), and Democrat Unification (Partido Unificación Democrática: UD). The PNH and PLH have ruled the country for decades. In the last years, Honduras has had five Liberal presidents: Roberto Suazo Córdova, José Azcona del Hoyo, Carlos Roberto Reina, Carlos Roberto Flores and Manuel Zelaya, and two Nationalists: Rafael Leonardo Callejas Romero and Ricardo Maduro. The elections have been full of controversies, including questions about whether Azcona was born in Honduras or Spain, and whether Maduro should have been able to stand given he was born in Panama. In 1963 a military coup was led against the democratically elected president Villegas Morales and a military junta was established to rule the country without holding elections until 1981with varying executive leaders. In this year Suazo Córdova (LPH) was elected president and Honduras transferred from a military authoritarian regime to an electoral democracy. 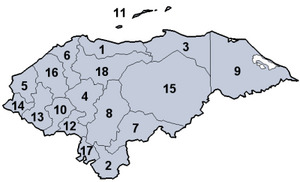 In 1986, Azcona del Hoyo was elected via the "Formula B," when Azcona did not obtain the majority of votes. However, 5 Liberal candidates and 4 Nationalist were running for president at that time, and the "Formula B" required all votes from all candidates from the same party to be added together. Azcona then became the president. In 1990, Callejas won the election under the slogan "Llegó el momento del Cambio," (The time for Change has arrived), which was heavily criticized for resembling El Salvador's "ARENAs" political campaign. Callejas Romero gained a reputation for illicit enrichment. Callejas has been the subject of several scandals and accusations in the last two decades. In 1998, during Flores Facusse's mandate, Hurricane Mitch hit the country and all indications of economic growth were washed out in a period of 5 days. In 2004 separate ballots were used for mayors, congress, and president. Many more candidates were registered for the 2005 election. The Nationalist and Liberal parties are distinct political parties with their own dedicated band of supporters, but some have pointed out that their interests and policy measures throughout the 23 years of uninterrupted democracy have been very similar. They are often seen as primarily serving the interests of their own members, who receive jobs when their party gains power and lose them again when the other party does so. Both are seen as supportive of the elite who owns most of the wealth in the country, with neither of them promoting socialist ideals, even though in many ways Honduras is run like a democratic version of an old socialist state, with price controls and nationalized electric and land-line telephone services. However, President Maduro's administration "de-nationalized" the telecommunications sector in a move to promote the rapid diffusion of telecom services to the Honduran population. As of November 2005, there were around 10 private-sector telecom companies in the Honduran market, including two mobile phone companies. The largest department by surface area is Olancho department and by population is Francisco Morazán department, where the capital city of Tegucigalpa is located, and the smallest by both surface area and population is the Islas de la Bahía department. The Honduran territory consists mainly of mountains (~81%), but there are narrow plains along the coasts, a large undeveloped lowland jungle La Mosquitia region in the northeast and the heavily populated lowland San Pedro Sula valley in the northwest. In La Mosquitia lies the UNESCO-world heritage site Río Plátano Biosphere Reserve, with the Coco River dividing the country from Nicaragua. See Rivers of Honduras. 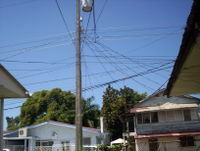 In Honduras the electricity comes in to households through overhead cables. Other cables carry telephone, cable television and broadband internet. The World Bank and the International Monetary Fund classified Honduras as one of the Heavily Indebted Poor Countries eligible for debt relief, and this debt relief was given in 2005. Both the electricity services (ENEE) and land line telephone services (HONDUTEL) were run by government monopolies, with the ENEE receiving heavy subsidies from the government because of its chronic financial problems. HONDUTEL however is no longer a monopoly, the telecomunication sector having been opened after December 25, 2005; this was one of the requirements before approving the beginning of CAFTA. There are price controls around the price of petrol, and other temporary price controls of basic commodities are often passed for short periods by the Congress. After years of declining against the US dollar the Lempira has stabilized at around 19 Lempiras per dollar. In 2005 Honduras signed the CAFTA (Free Trade Agreement with USA). In December 2005, Honduras' main seaport Puerto Cortes was included in the U.S. Container Security Initiative. The population of Honduras is predominantly of Mestizo descent and Roman Catholic faith. Along the northern coast were until recently communities of English speakers who maintained a separate culture, as some islands and sections along the Caribbean coast were occupied by pirates and by the British at one time or another. Groups of Garífuna (people of mixed of Amerindian and African ancestry) live along the north coast and islands, where there are also many Afro-Latin Americans. Garífunas are part of Honduras' identity through theatrical presentations such as Louvavagu. Asians in Honduras are mostly of Chinese and Japanese descent. Hundreds of families can find their roots in the Middle East, specifically Lebanon or Palestine. These Arab-Hondurans are sometimes called "turcos", because they arrived in Honduras using Turkish travel documents, as their homelands were then under the control of the Turkish Ottoman Empire. The "turcos", along with the Jewish minority population, exert considerable influence on Honduran economics and politics through their industrial and financial interests. 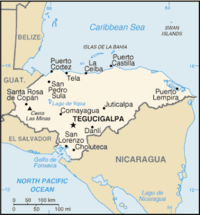 Many other Hondurans have connections to Spain, the United States (especially New Orleans) and the Cayman Islands. Chortí (Mayan descent), Pech or Paya, Tolupan or Xicaque, Lenca, Sumo or Tawahka, and Miskito still exist, and most still keep their language, Lenca being an exception. For the most part, these tribes live in extreme poverty. A Honduran can be called a Catracho or Catracha (fem) in Spanish. The word is derived from the last name of a french Honduran General Florencio Xatruch, who led Honduran armed forces in defense of Honduran territories in 1857 against an attempted invasion led by North American filibuster William Walker. The nickname is considered complimentary, not derogatory. One of Honduras' best known writers is Ramón Amaya Amador. Other writers include Roberto Sosa, Eduardo Bähr, Amanda Castro, Javier Abril Espinoza, and Roberto Quesada. Óscar Andrés Rodríguez Maradiaga is a Cardinal who was a potential candidate for Pope in the Papal conclave, 2005. Not as famous as the cardinal, but also noteworthy, and in a different field, is Salvador Moncada, a world-renowned scientist with authorship of more than 12 highly cited papers, including his work on nitric oxide. His research on heart-related drugs includes the development of Viagra. Moncada works at the University College of London and funds an NGO in Tegucigalpa. He is married to Princess Maria-Esmeralda of Belgium. Honduras This Week is a weekly English language newspaper that has been published now for 17 years in Tegucigalpa. On the islands of Roatan, Utila and Guanaja the Bay Islands Voice is a source of monthly news since 2003. Three important Honduran journalists: Neida Sandoval and Satcha Pretto work for Univision in Miami, Florida and Dunia Elvir works for Telemundo in LA. Honduras is part of Mesoamerica, which is the landmass that extends from Mexico to Costa Rica. The region is considered as a biodiversity hotspot due to the numerous plant and animal species that can be found. Like the other countries in the region, Honduras contains vast biological resources. This 43,278 square mile (112,092 km²) country hosts more than 6,000 species of vascular plants, of which 630 -described so far- are Orchids; around 250 reptiles and amphibians, more than 700 bird species, and 110 mammal species, half of them being bats. Besides lush rain forests, untouched cloud forests (which can rise up to nearly three thousand meters above sea level), mangroves, savannas and mountain ranges ladden with pine and oak trees, Honduras harbours yet another priceless ecosystem: The Mesoamerican Barrier Reef System. In the Bay Islands it is no coincidence to swim with bottlenose dolphins, manta rays, parrot fish, schools of blue tang and even the colossal whale shark. The white sands, tall coconut palms and the easy going caribbean atmosphere provide refuge from the busy Central American cities, or across the Atlantic Ocean. Honduras is a country full of Folklore, its famous Lluvia de Peces (Rain of fishes) is unique in the world. The legend of el cadejo is also popular. Honduras boasts the oldest functioning clock in the Americas; built by the Moors in the 12th Century and transferred to the cathedral of Comayagua in 1636. Honduran Cuisine makes extensive of coconut, in both sweet and savory foods, even in soups. The country once had a communist rebellion, which, like El Salvador, transformed itself into a political party. Today this communist party is gone. Honduras only has one lake in the entire country, Lago de Yojoa.